Data from the Australian Bureau of Statistics (ABS) shows that living expenses for employee households were up by 2 per cent in September 2018 compared to a year ago. Among self‑funded retiree households and age pension recipients, living costs rose by 2.3 per cent and 2.2 per cent respectively. But don’t panic. By being organised and smart about your finances, you could manage rising costs without draining your savings and sacrificing your financial security. Reducing your expenses is an obvious way to manage the high cost of living. But rather than taking a piecemeal approach, it may be more effective to cut back on the largest drains on your funds. For a start, you may want to trim costs in areas that, according to the ABS, account for more than half of Australian households’ weekly expenditure: housing, food and drinks, and transport. Do you really need a second car? Can you negotiate a lower mortgage rate with your lender? Paring discretionary expenses in these areas may result in big savings. It may be worth auditing your lifestyle expenses to see if you could do some pruning. These costs can burn a big hole in your pocket if you don’t monitor or check them. Research shows that Australians spent $145 billion on lifestyle goods and services in 2017. While you don’t have to give up all the things you enjoy, cutting down on, for example, your overseas holidays or dining out could go a long way towards reducing your costs. Savings in these areas may help you cover essential expenses or boost your nest egg and investments. Having a budget and sticking to it may help you minimise unnecessary expenses. A budget tracks your weekly or monthly spending and may help ensure you have enough money to cover essentials while being flexible enough to manage unexpected or increased costs. To create a budget that factors in your income, expenses and financial obligations, it is recommended that you consult a professional financial adviser. Your adviser may also suggest ways to manage your costs and build up your savings. Increasing your income could be another way to ride out the rising cost of living. You could do this by taking on extra work in your spare time or starting a side business. And in today’s digital sharing economy, earning extra money in a way that suits you has never been easier. Become a private tutor in your field of expertise. If you’re an avid gardener, advertise your gardening services online and in your community. Rent out your car or a spare room in your house, join the drive-share economy or even pet sit. By having one or two side gigs, you won’t have to dip into your savings just to meet the rising cost of living. If you have enough savings on top of your emergency fund, you may want to consider investing to grow your capital. Your financial adviser could recommend strategies to help you generate an income from your investments. The high costs of goods and services may affect your savings and lead to money-related stress. But if you’re smart about your finances, you could keep your cost of living in check and remain financially secure. 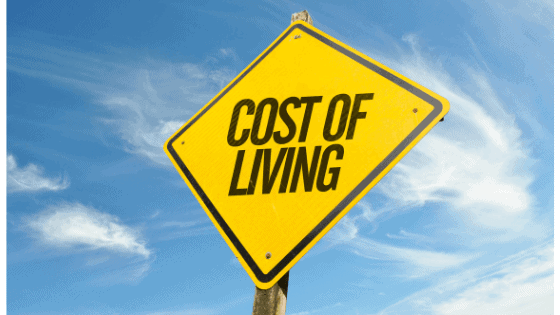 Australian Bureau of Statistics, September 2018, ‘Selected Living Cost Indexes, Australia’. Accessible at: http://www.abs.gov.au/ausstats/abs@.nsf/PrimaryMainFeatures/6467.0?OpenDocument. Australian Bureau of Statistics, September 2017, ‘Household Expenditure Survey, Australia: Summary of Results, 2015–16. Accessible at: http://www.abs.gov.au/ausstats/abs@.nsf/Latestproducts/6530.0Main%20Features32015-16. Mozo, August 2017, ‘Australians eating away savings, spending a whopping $4 billion on food and drink per month’. Accessible at: https://stat.mozo.com.au/images/more-on-mozo/media-releases/MOZO-MEDIA-RELEASE-cost-of-lifestyle-2017-final.pdf. The information provided in this document, including any tax information, is general information only and does not constitute personal advice. It has been prepared without taking into account any of your individual objectives, financial situation or needs. Before acting on this information you should consider its appropriateness, having regard to your own objectives, financial situation and needs. You should read the relevant Product Disclosure Statements and seek personal advice from a qualified financial adviser. The views expressed in this publication are solely those of the author; they are not reflective or indicative of Licensee’s position, and are not to be attributed to the Licensee. They cannot be reproduced in any form without the express written consent of the author. From time to time we may send you informative updates and details of the range of services we can provide. If you no longer want to receive this information please contact our office to opt out. Millennium 3 Financial Services Pty Ltd ABN 61 094 529 987, AFSL 244252.